A variety of materials can serve as a drive band. As long as it grips the wheel and whorl and doesn't stretch too much over time then it should work. I've even seen knicker-elastic used very effectively. 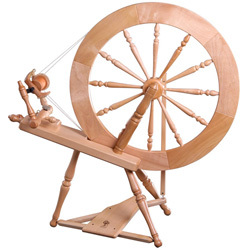 A double-drive wheel needs the band to slip a little bit in one of the whorls (often one whorl is V shaped and one U shaped) but with a single-drive wheel, more grip allows you to use less tension and makes for easier treadling. An upgrade for the standard string drive band is a flexi-drive band; sometimes called poly-cord or stretchy drive band. Fitting it involves cutting it to length and joining the ends with heat. But it's not as scary as it sounds. 1. Cut the cord to length. Do unwind your drive band tensioner to its lowest setting and wrap the cord around the largest whorl. 2. Do Practice. Use the piece that you've trimmed off and practice the following steps until you're confident and can make a good strong join. 3. Do loop your cord around your wheel. If you forget, then you won't be able to fit the band without cutting it again. 4. Immediately push the ends together. Ashford used to supply this helpful tool, which is a little block of wood with a groove in it, but they seem to have stopped including it now. If you don't get one with your band then perhaps you can improvise one, or just take care to push the ends together as accurately as you can. Don't worry about a little material squishing out because you'll trim this off. 5. Do wait. Continue to push together for about thirty seconds. Carefully let go without pulling it, then go and make a cup of tea. It takes a minute or two for the join to really cool and harden. 6. Trim off the blobby excess with a craft knife or nail clippers. If it hasn't joined properly, just cut the ends square and try again. Cut off as little as you can for obvious reasons. 7. Do slip the band off the biggest whorl or loosen the tension when your wheel isn't in use to avoid it stretching. If it does get longer over time, just cut a small section out and join again. Thanks Sue - people knock the string, but it's well-suited to the job!